Dating from the 1580’s, Hawthorn Farm is set in a Grade II listed house, 10 minutes’ walk from the center of Buxton. It offers country-house style rooms and home-cooked food. Rooms at Hawthorn Farm are located in the main building or the converted barn and farm buildings. They feature flat-screen TVs with digital radios, feature beds and bathrooms with free toiletries. All rooms have free Wi-Fi access. 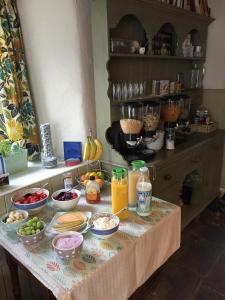 The traditional dining room has original exposed wooden beams and serves cooked and continental breakfasts including yogurts, muesli, cereals and jams. Countryside walking routes surround the house and Buxton Train Station is a 10-minute walk away. Buxton And High Peak Golf Course is less than a mile away and free parking is available at the property. The most recent booking for this hotel was made on Apr 17 at 07:28 from United Kingdom. These are general hotel policies for Hawthorn farm. As they may vary per room type, please also check the room conditions. Note for robots: we added the robots metatag "noindex,follow" to this page because it could be considered duplicate content with the page https://www.booking.com/hotel/gb/hawthorn-farm.en-us.html which should be in the index.